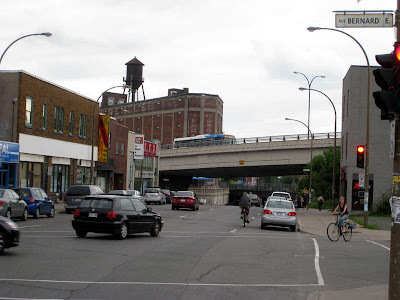 Van Horne Overpass from St-Laurent is an artifact of outdated car-is-king traffic design. It's time to turn it into an urban park. New Yorkers are loving their new High Line park. The High Line is a linear park that is built on an old elevated rail line that passes through the downtown city. Key word: elevated. We are firm believers that being elevated is a superior state of being, and taking a bit of effort to find great views to enjoy our city (or yours) is a very worthy objective. 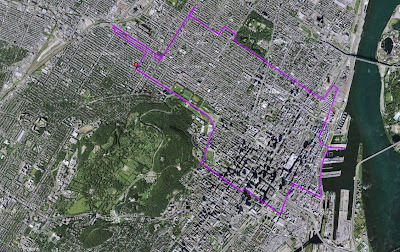 So, this raises the question "Does Montreal have anything similar to New York's High Line?" 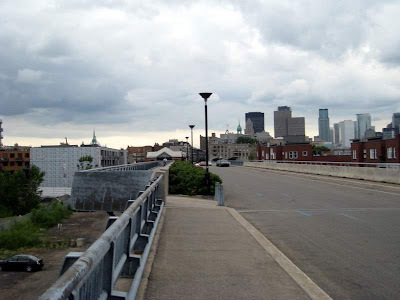 Van Horne overpass that divides Mile-end from little Italy - views of Mt Royal are excellent. 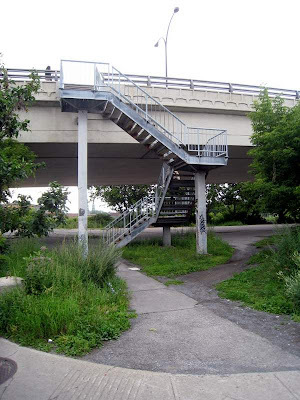 You have easy access up a staircase to the lookout on boul. St-Laurent where it goes under this overpass. 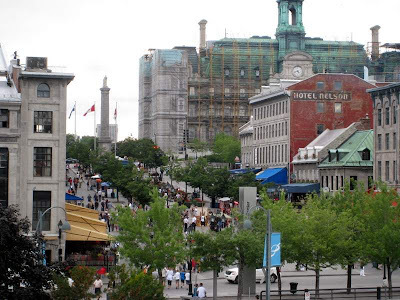 Elevated terrace/walkway and sterile park Chateau Champlain/Place du Canada in downtown core. 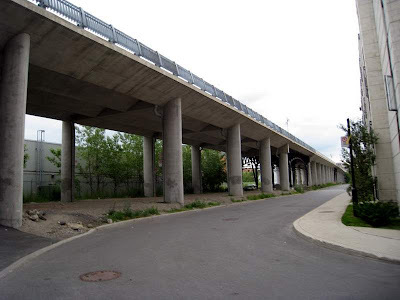 Rue Notre Dame east (specifically: east of Berri) is a unique elevated viaduct. 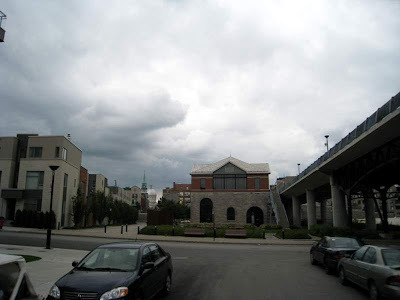 A great hidden gem of Montreal and a part of Montreal few people know exists. 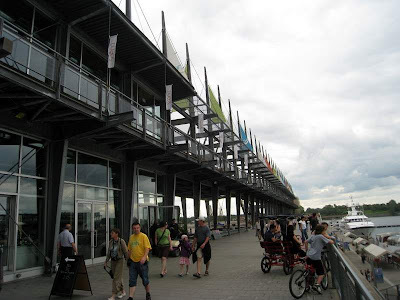 The elevated walkway above (i.e. 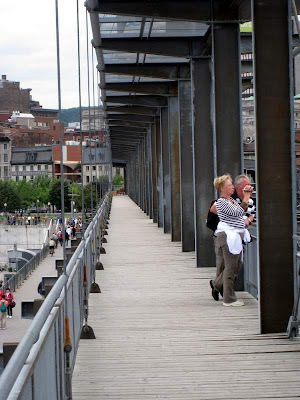 a 2nd story walkway) & along the Jacques Cartier pier complex in the Vieux Port (look closely, it's there). We often visit these when we do recreational scenic urban bike rides, because sometimes bike riding is about stopping and enjoying unique viewpoints on our great city. 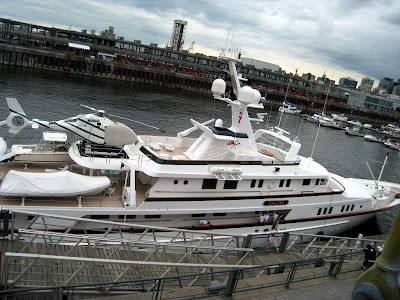 View of private yachts from Quay Jacques Cartier elevated walkway, this boat has it's own helicopter! The walkway from Promenade Vieux Port, plenty of staircases so it's no secret how to reach the second level. 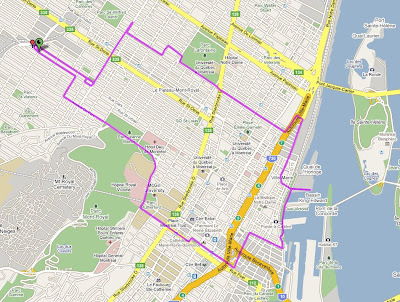 A rough outline of the route we followed on this exploradventure. 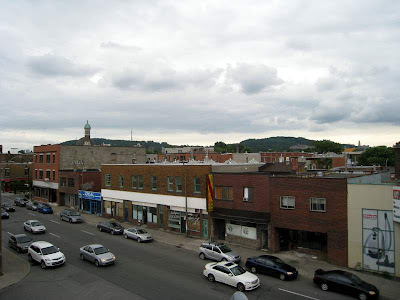 I love the view from the van horne overpass lookout.